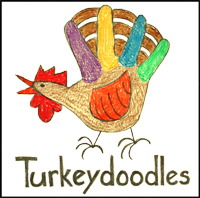 Turkeydoodles | Because they are learning so much… and my memory is lousy. I am a terrible procrastinator. Actually, I’m a very GOOD procrastinator, in that I’m a total pro at it. I’ll do darned near anything to put off doing cleaning, and I’ll do cleaning to put off doing paperwork! Sort of like you never want your kids to get good at dealing with trauma, I never want my kids to hone their procrastination skills to be as sharp as my own. How did I get this way? Well, when I was in elementary school, I didn’t want to stop playing or reading or watching, just like every other kid in America in the 1970’s and 80’s. I got into battles with my parents about when I’d do things, and always managed to squeak things in under the wire. I didn’t know about self-handicapping back then, but I sure knew how it worked: I’d put lots of effort in at the very last minute, get a B, and Dad would castigate me that I could have gotten an A if I had started earlier. It was way easier to handle that than to do the work in a more timely fashion fearing that I would *still* only get a B, and then feeling stupid. This way the emphasis was on my time-management skills, not on my actual academic abilities. Roll forward to my freshman year of high school, when my honors biology class had to do leaf collections. The rubric had a minimum of 80 identified leaves to be able to qualify for an A grade if everything else was good, and there it was, approaching the wee hours of the day it was due, and I couldn’t ID the stupid 80th leaf I had in my possession. 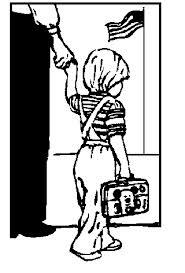 I was exhausted, and wanted to go to bed, but Mom laughed and whisked me off in the family station wagon to a front yard across town where she knew there was a mulberry tree. So there we were, at literally 1 AM, in our jammies, sneaking across a suburban front lawn stealing leaves, with my mother laughing and joking about how she’d explain this to the police if they showed up. It is still one of her favorite stories, but to me it is a story of my mother enabling my procrastination in a very sweet and funny way. I got an A, and eventually a BS in Forest Biology, but I still kept procrastinating. Procrastination has cost me opportunities. It has cost me money. It has cost me friendships. It has cost me positive self-concept. I sometimes feel so deep in undone to-do lists that I feel like I’m drowning in them; so overwhelmed that I can’t do *anything*. Suffice it to say that this is not something I want for my children. Yesterday, in my post about being a work at home parent and homeschooling, I talked about how our new rule is that my kids need to do their homeschooling (usually workbooks, but substitutes are fine) the *day before* the computer privileges it earned them. They all agreed to that rule, and went off to play, and Big D and Buddy came back to their homeschool early enough in the evening to get it done before bedtime. Not so much for Beara. She was working on counting money, which is challenging, but she wasn’t giving it her attention, and kept wandering off, so that when I called then minutes until bedtime, she lost it, demanding that I or Daddyman help her finish in time. Daddyman went to sit with her in the hallway, but I told him the time, and how she had procrastinated all day, he sighed heavily, and Beara went to bed grumpy, but cheered somewhat by the idea that she and I would sit down and have some special one-on-0ne time while her sibs played Minecraft today. Beara did the last two pages of that assignment today, so she’ll get to use her computer tomorrow. She has begged for her computer about 30 times, and has been caught looking over her siblings shoulders at YouTube videos WAY more than once. Do I feel like a jerk? Yup. Did I get into a power struggle with my seven year old over some completely arbitrary thing, and a new one at that? Yup. Am I completely good with these things if it stops her procrastination from becoming the habit of a lifetime? I’m going to say yes to that, also. Today’s Quandry: We are whole-life and lifelong learners here, but workbooks give us a foothold with the 3Rs, so we use them. New rule for my Minecraft and YouTube loving kids is that they need to do 10 pages of any of their workbooks to earn their computers for the following day. That worked great, until kids started getting behind, and wanting to do their pages on the day they wanted to use their computers. I went with that for a bit, but now that we’re settling into new schedules, and I have paperwork piling up, not so much. You can imagine the interruptions and divided attention, I’m sure. I like to do my work in the morning, when the house is usually at its quietest, and I am at my most productive. It also lets me have a care-free rest of my day, since I know I’ve already gotten accomplished at least a solid chunk of what I need to do. That works great, as long as my kids aren’t grumpily and sleepily wanting help with their homeschool so they can go wake up properly to the latest CupQuake video. Then they ‘pester’ me with things that are NOT issues when they are fully awake and *not wanting to be off doing something else*. So, after 45 minutes of such stress this morning, I told them that today they could go use their computers as they wish, but that they needed to do their ten pages at some point today if they wanted their computers for tomorrow, no exceptions. They liked that idea. 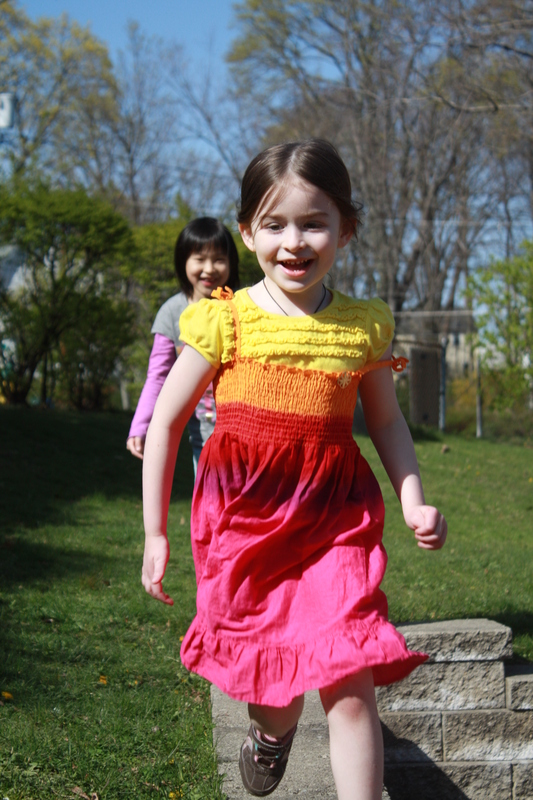 They ran off to play, but I bet they’ll be back at their workbooks this afternoon, played out from soccer and a playdate, and ready to work. I’m sitting down next to a large pile of nearly pristine workbooks we’ve acquired for this year, so I figured I would update our curriculum page to show what we’ve got here and why. I’ll let you know when I’ve posted this year’s computer/iPad/video program items, as well as other community resources we enjoy, both online and in person. Cultivating wonder is one of my major jobs as a science educator, so you’d think that I’d have pushed for my kids to see LADEE launch last night. Nope. *I* saw LADEE blaze across the southern skies last night, an orange oblong fireball that snuffed out the second our streaming NASA channel reported the dropping of the third stage. It was so very, very cool, seeing my first launch ever. Seeing something going to the MOON. Seeing it from a second story window in my *own house*. But the kids missed it. We’d put them to bed, figuring that it would be too late, and that we probably couldn’t even see it from the top of the hill near our house, and even then the park up there is shut after sunset. We were bummed, but out of ideas. Daddyman is like a kid on Christmas for space travel though, and he went, hopeful like a kid, to the window to see if he could see anything. And he could, intermittently through the trees. He knew it was LADEE when it got dimmer when our NASA feed reported the drop of the second stage, and I got to the window right when it emerged from the trees into the clear night sky. I still wasn’t convinced until the oblong fireball snuffed out when the stream reported that the third stage had been dropped. So very, very cool, seeing something that was going to the MOON. And yet I don’t feel badly that the kids missed it. Sure, it was AWESOME, but I got it by luck and surprise, and didn’t actually expect to see it. If we’d kept the kids up on the thin, rather outlandish hope that they’d be able to see it without even going outside, the memory that they would most likely have of the evening would have been pure disappointment, and I’d rather have them regret missing it than watch them get discouraged and let the very idea of space lose some of its shine in their eyes. Instead, I told them about it this morning, and their eyes? They SHONE. Have a kid, especially a girl, that is into science? Have kids that like Lego? Read here to learn about the history of STEM minifigs (Lego people), as well the secret code that will let you find which Series 11 minifig packet contains the new female scientist minifig, complete with Erlenmeyer flasks! I haven’t posted here in well over a year, but I’m back, and looking to get back to documenting our lives a bit, and talking about what education is, and can be. 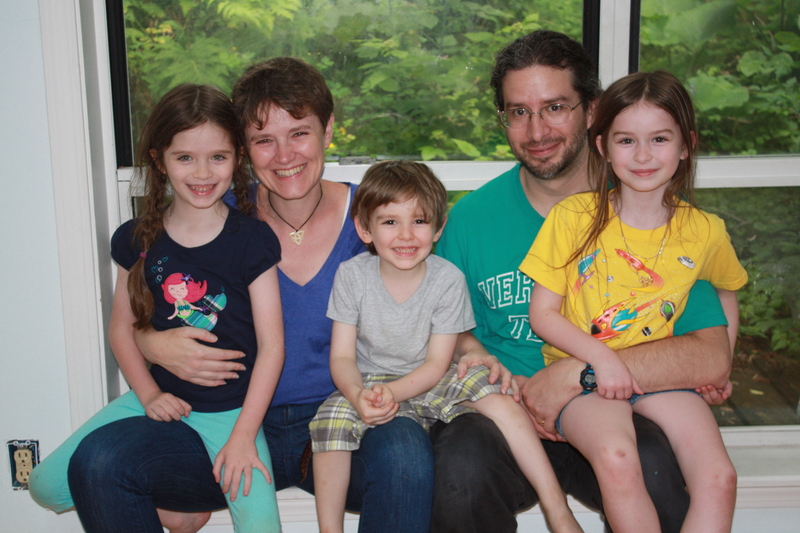 Saying goodbye to our house in Vermont in July 2013. Sad to go, but excited about our future in Boston. The major reason for the hiatus was that at the end of 2012’s summer full of loveliness, we came down to Boston from our home in Vermont to spend time with my Dad while my Mom got a break from caring for him, and discovered just how much help they needed. We started looking for housing and work immediately, and began our move to Boston in October, moved all winter long, and finally sold our Vermont house in July. Biggest influence on their education this year, aside from the chaos of the move, has undeniably been Minecraft. Santa and Uncle George thought they’d like it, so we each have an account, and we all love to play together, doing collaborative work, building near one another, rescuing each other from skellie snipers… like you do. The kids started watching YouTube videos about the game, then Big D started using them like video encyclopedia of the game, searching for how to do cool things she’d heard about, then watching over and over until she nailed it (things like redstone wiring), and back into the game she went, and still goes, nine months later. Beara took Minecraft to a more social place, wanting to chat, decorate, and watch videos of her favorite Minecraft hero, Cupquake. Beara is begging me to help her make her own gaming videos now, and we’ll see. Buddy loves running around, helping out, but isn’t very good at acquiring his own resources, preferring to get them from the rest of us. Great environment for us all to interact in, though, and I think I talk to Big D more in chat now than I do in actual speech! Anyway, more on Minecraft later; this has been an incredible educational sandbox for them to play in, and I have a lot to say about it! So, here we are. Had we been public schoolers, today would have been Buddy’s first day of Kindergarten. A rite of passage for him, at least by mainstream standards, as well as one for me; bundling my last baby off to school. Both Beara and Buddy will be taking one class a week at our local public elementary school; music for her, art for him. (D has opted out.) Being part of a school at all will be new for us, but this way we can wade in, and test the waters, rather than jumping – or being thrown! – into the deep end of public education. We’re having public school a la carte, so to speak, and I’m optimistic that we’ll like it. We don’t start wading until next week, but we began some back-to-school dining last night; we had some public schooling neighbors over for a relaxing ice cream party last night. Both parents had hit different, overcrowded malls for last minute stuff all day, so they needed it more than the kids did! 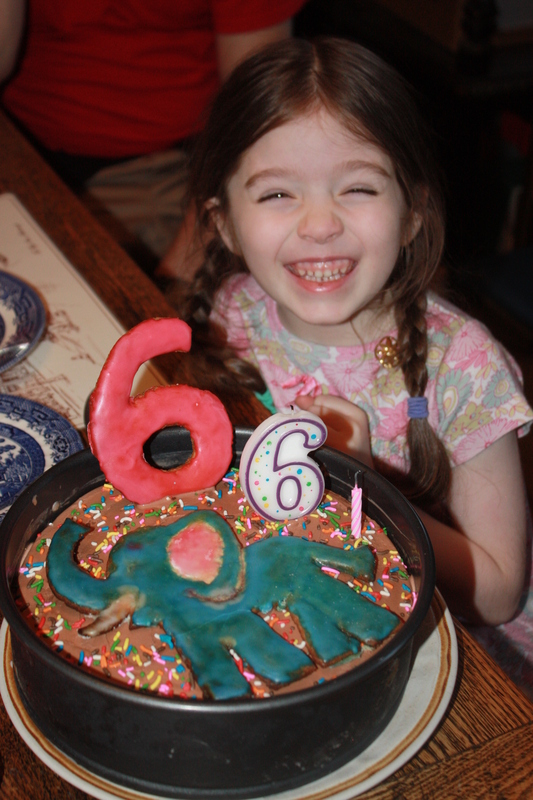 The kids, K-6, had fun being kids together, and we parents chatted about anything and everything BUT school. Their kids are now off in first day outfits, doing all that First Day stuff, while Daddyman is off at his first non-orientation day of his new job, Buddy and Beara are both still fast asleep at nearly 10 AM, Big D is watching a video about a game that she says is like Minecraft, but with asteroids, and I’m here, writing about this last year, and dreaming about the coming one, excited that, yet again, I get to spend it with my kids, watching all of us grow. Have been off being, instead of here writing, but just came across a great little video that helps explain the Higgs theory pretty well, as well as what the heck all these little particles are, what the LHC is, etc. I got sick four times, and at least one child joined me in welcoming each new virus. My computer also BSOD’d twice, which fouled me up almost as badly, as you can well imagine. 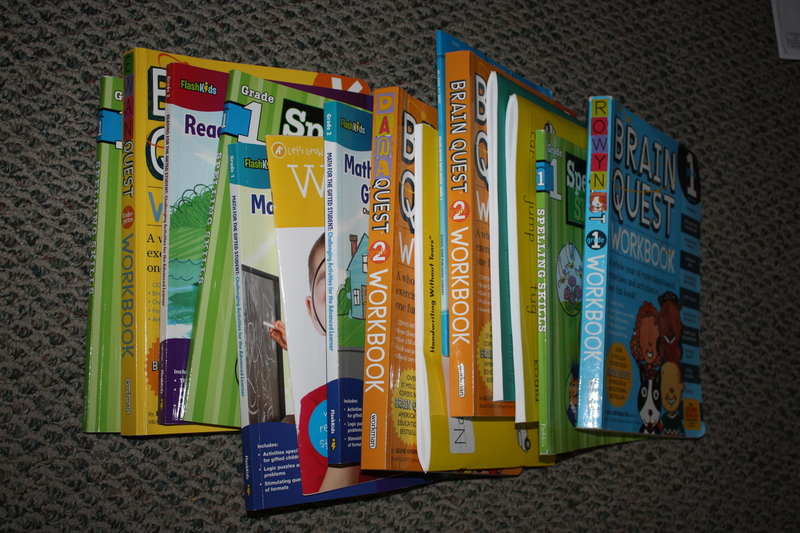 All three kids tried Reading Eggs for their free 35 day trial via the homeschool coop. We enjoyed it (Big D did 12 lessons one day), but the price tag (since it is per child, not per family) is just too much for us to justify. Nice to get a better handle on their actual reading levels though; the computer interface made them willing to really push themselves in a way that allowed me to see exactly where they were struggling. We’ve taken advantage of Daddyman’s flexible work schedule, our new-to-us road worthy minivan, and the hospitality of friends and family to go on four trips to Massachusetts for birthdays, beach combing, SCA events, and the Cambridge Science Festival, which included National Astronomy Day at the Clay Center Observatory (so much fun that it will get it’s own post). 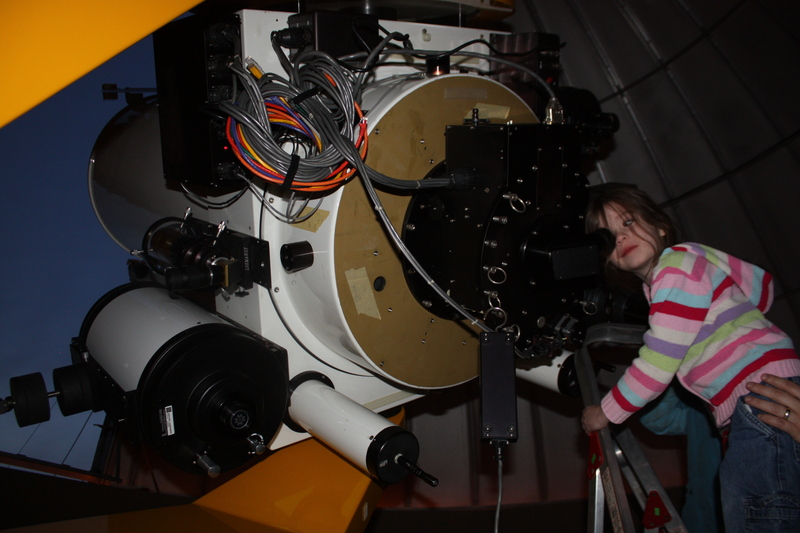 Big D checks out Venus at the Clay Center Observatory (Brookline, MA) during National Astronomy Day. We wrapped up our spring classes and year long programs; dance class, book club, and the creative problem solving group I ran at our local library. I’m planning to run two days of playground physics sometime later this spring, when the temps decide to stay above freezing for a week or more. Only speech therapy continues until the end of the public school year, and Big D continues to have fun making great strides, so we’re glad! 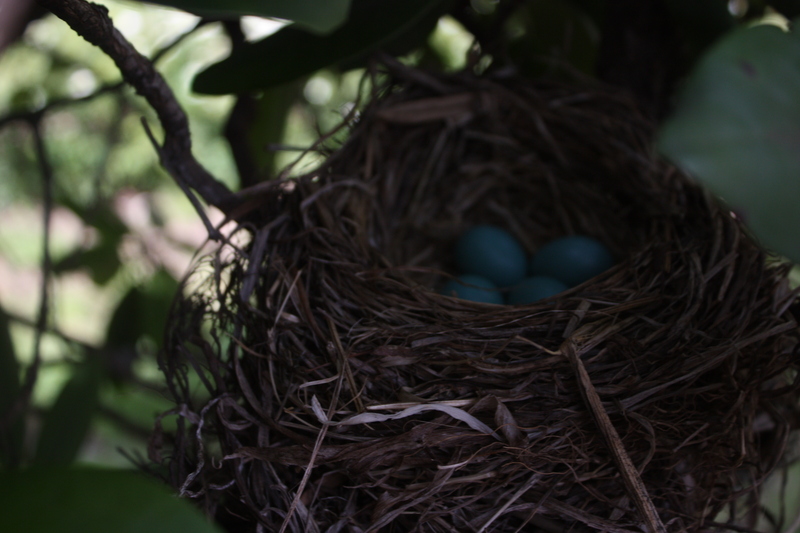 A robin’s nest in my mom’s rhododendron. Bon chance, little birds! April 30, 2012. Also? Spring is coming, after a long winter-that-wasn’t. Nothing much flowering here in Vermont yet that hasn’t been destroyed by our much needed but ruinous rain, so here’s a parting shot of robin eggs in my mother’s garden in Boston. Pardon the lack of focus, but I wasn’t sure there was anything IN the nest until I took this picture, holding the camera up over my head. Enjoy!